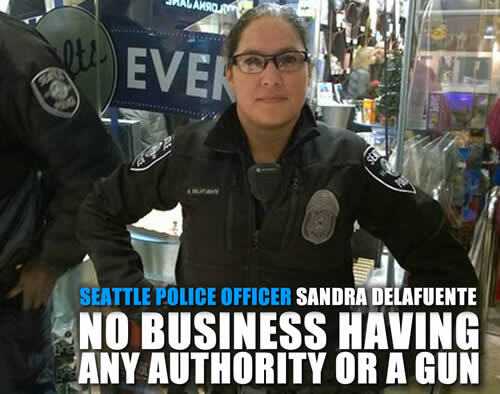 Seattle Police Officer Sandra Delafuente is a perfect example of the wrong person getting hired as a Peace Officer. With obvious issues this problem cop should have been fired but probably walked away with paid leave and a slap on the wrist. Instead it cost the tax payers $100,000 dollars. In the video Officer Sandra Delafuente is more like a rabid dog acting out her “little woman” issue by screaming at the public, all while other officers are aware there is no danger or need for macing people. Obvious she is fearful and never should have been given any form of police equipment. When America finally takes a stand and demands problem people like this are fired and not allowed to abuse the public we’ll see change. Garfield High School teacher Jesse Hagopian, who is also a nationally-recognized education activist, has reached a $100,000 settlement with the City of Seattle and Seattle Police Department over his pepper-spraying during last year’s Martin Luther King Day demonstrations. 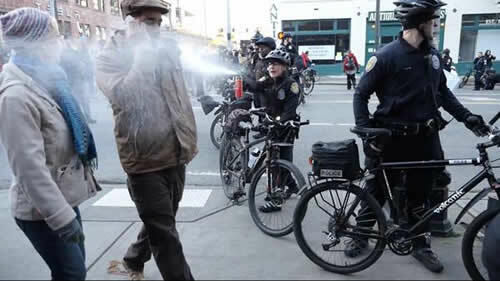 Hagopian was on the phone with a family member, when, out of nowhere, Officer Sandra Delafuente began screaming at the crowd and spraying in a side-to-side motion. But the city did not admit any wrongdoing in the settlement. In November, Officer Sandra Delafuente was deployed to the frontlines of racial justice protests once again. Incidents like this would not happen if the officers were personally liable and accountable for their actions. They should be required to have their own liabilty insurance and if insurance won’t cover them they should not be allowed to work.